Mabul Island came into the scene after Sipadan island was declared a protected area. All the diving operators have to look elsewhere to provide accommodation. 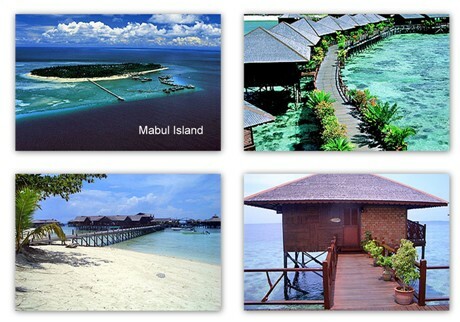 The nearby Islands seem the obvious choice – Mabul & Kapalai Island. Mabul Island provides the best muck diving in the region and macro life here is pretty incredible. You can still dive around the famous Sipadan waters with a permit. A handful of dive resorts operating here. Arrive Tawau AirportMeet by our staff at the airport arrival hall & transfer to Mabul Island. A check-out/orientation dive before lunch. A boat dive in the afternoon + unlimited shore dive. Daily 3 boat dives + unlimited shore dive. ***Please note that some of the dives will be arranged to Sipadan Island & Kapalai Island as well. Relaxation in the morning. Depart Mabul Island Island by boat to Semporna. Transfer to Tawau airport for your onward flight (Breakfast/Lunch ) End of service. Unlimited Mabul House Reef shore diving from 06:00 AM to 06:00 PM, weight, weight belt and tanks. Unused portion of the dives is not refundable and not transferable.